It came to me from a e-mail. I put the frame on it..
That is from my good friend Carol.She has some wounderful Tubes.. So if your looking for some good ones..
who made this wounderful photo.. Please let me know so I may give them credit..
so I can't address you personally. knew personally, but people like us. future, not just for us, but for the world. and members of their faiths. own country and who sought refuge here. Your act was a slaughter of the innocents. apart, and in the end can never destroy the soul. of bodies, but you will never destroy the soul of America. dented, but not even a trial by fire can melt. win a battle or two, but you will never win this war! as long as America has thrived and prospered. and we will now rise up stronger than before. there in your private hell and later in your eternal one. and because we are America, we would respond. We will help them rebuild from the ashes. a beacon of democracy and hope to the rest of the world. 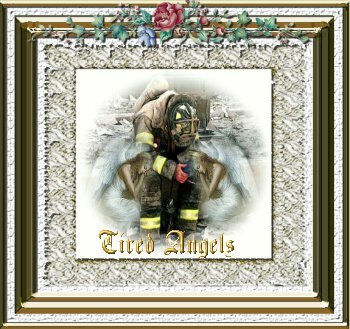 all I did to them was add the frame..and names..
And I did resize them..
please contact me,so I may give them credit,for there wounderful work.. It Came To Me From A E-mail..
All I did to it was add the frame..
As we lit candles of waiting and hope We became one generation. As the firefighters and police officers fought their way into the inferno We became one gender.